I call him Bro. 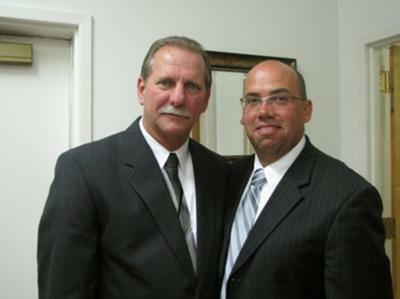 Mitch, and he pastors Freedom Free Will Baptist Church in Buford (Lancaster) SC. He has been there from the beginning...the church started in a Child Care nursery in Buford (next door). A group of Christians wanted to start this new church eleven (11) years ago, so they met and prayed and Bro. Mitch was called. I have only been there for 2 and 1/2 years now but I've seen him visit people in the hospital when their own pastor wouldn't go to visit with them. (He will ONLY go if his churchmembers ask him to, because he doesn't want to step on another preacher's toes). It's his "personable" ways that speaks to my heart and I appreciate him more for that! He's always concerned about 'not hurting' anyone with everything that comes up to do... I started doing the bulletins recently, and he wants me to put things in there that, "encourage the people to live for the Lord." He tells anyone who has made mistakes (all of us, right? ): "Don't quit! Don't quit! Get up and get right with God and keep going, but Don't quit!" I love him and his wife Chris, and pray for them to be strong in the Lord!